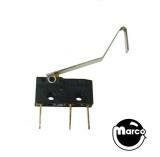 Switch mini w/flat blade 1.05"
Miniature switch with flat actuator lever. Miniature snap action switch with 3 terminals and custom wireform. Miniature microswitch switch with 1-3/4" flat actuator. Sub miniature snap action switch with 3 terminals and custom wireform. Use 12-SMSB and trim actuator as needed.